Making the switch to plan-based, for my work and my meals! Some hacks on how to work more efficiently and eat healthier. So many new restaurants are opening in Dallas, but when it comes to burgers, I feel like you gotta go with a local joint. Because Texans know their meats! Hailing from Austin, TX, Hopdoddy is still my favorite! Happy National Donut Day! Here are some of the best donuts you need to try around the big D! Delicious pizzas made of fresh ingredients, warm garlic knots, creamy tiramisu - I had a great time with my girlfriends at Russo's in Richardson, TX. Read along, leave a comment, and get a chance to win a $25 gift card! A bright and happy place serving good food made of quality local produce, Flower Child is finally open in Dallas on March 14! Very family-friendly with a good variety of menus, organic wine, and a mean olive oil and lemon cupcake! 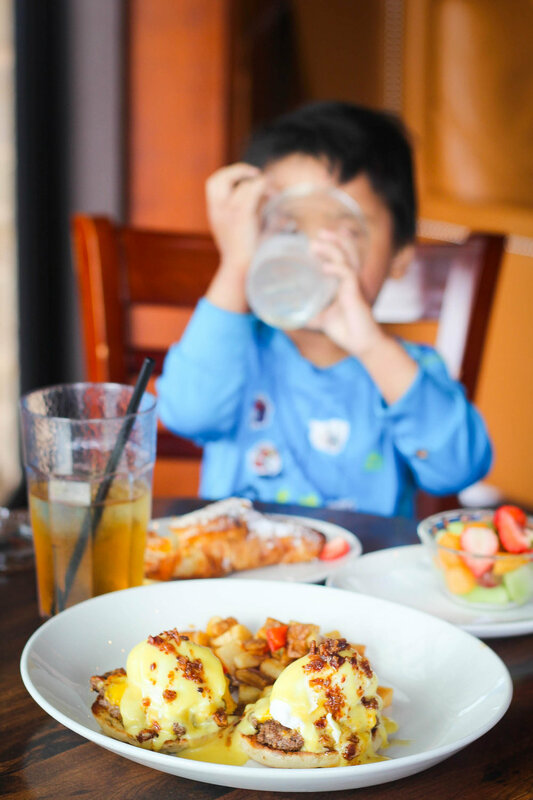 Deep Ellum might not be the typical area for your to go for a Sunday brunch with your family. But this one spot might change that. This is Filament! The weekend is almost here and it's time for me to share about my current favorite place to eat around the DFW metroplex and beyond. My family has been so blessed to be able to do this together as a unit, and J has been such a good little foodie so far so we hope that we can keep this up at least once a month! ;) We had never been to Denton's Historic Downtown Square before so we were so excited to come explore it two weeks ago. They have everything from coffeeshops, pizza places, to boutiques, and more importantly, Denton's first brewpub restaurant, Barley & Board. Nestled in the historic Texas Building, Barley & Board has that industrial-country feel to it with bricks, woods, leathers and of course a moose head wall mount. You can hear music like those of Alina Baraz & The Galimatias playing in the background while watching people taking pictures by the mural right across the street through their huge windows. Check out the in-house brewery! Looking at it got us thirsty! Actually, looking at their menu would make you thirsty, because they pair every meal with a matching beer right on the menu cards! Anyways, Mr. Man went ahead and ordered one of their IPAs. I had one of their craft cocktails called Clara Lou, which is an original creation by B&B's bartender that is made of tequila, hibiscus syrup, lime & grapefruit. Ooh, yes it was good. And that flower is edible by the way! Our very knowledgable waiter recommended us to try their Sweet Potato Hummus which is served with warm pita breads, pepitas, and chipotle oil. So we placed our order while snacking on some warm sweet & spicy mixed nuts. It's got thyme, brown sugar, and cayenne! Not your regular mixed nuts! The hummus was bomb!! What a brilliant idea! The mashed sweet potatoes with garlic and chickpeas make such a great combo. Love the sweetness that you don't normally get in regular hummus. And the Bacon Wrapped Medjool Dates were beautiful. The chorizo and piquillo sauce meet the sweetness of the dates - yummm. I admire Executive Chef Chad Kelley's attention to detail! You're probably wondering what J was having. Well he LOVED their matchstick fries! So much that he didn't mind having them without ketchup! We had heard that the B&B's Burger had just been named the best in Dallas by D Magazine, so of course Mr. Man had to give it a try. It was very straightforward and simple, they didn't try to get too fancy with it. A couple of fluffy buns, a well-seasoned patty, sweet onions, house sauce and American Cheese (yes, not brie cheese or anything like that) - and you got an amazing burger. Well, burgers don't have to be complicated right? Now my friend, the picture above is a pic of the Sweet Pig & Angry Bird: half rack ribs, brazen quail, slaw, & pickles. Yup. Seriously, bomb! The sauce really stood out for me because it has that tanginess to it that I like. Now we were super full by this point, so we decided to box out the leftovers and went straight for the happy endings ;) They don't have their desserts printed on the menu cards, but they do serve them, so you better check with your waiters. I ordered the scrumptious deconstructed strawberry shortcake with lemon shortbread and amaretto whipped cream. I could taste a hint of basil on their strawberries sauce there. So divine! Mr. Man went with B&B's own version of s'mores with a thick oatmeal cookie, thick toasted marshmallow cream, and dark chocolates. Again, I love how Barley & Board takes something familiar and classic, and make it their own. Not overly complicated, although very detailed, and highend but approachable. We can't wait to go back! Rustic, Cozy, & Generous - It's Great Harvest Bread Co. The first thing you'd notice when you walk into this place is the rustic, magnolia-ish vibe that they've got going on here with wooden tables, wooden crate boxes, a marquee sign, and metal signs. You can hear songs like Vance Joy's Georgia playing in the background, and sometimes even the sound of the employees karaoke-ing to the store's playlist while happily preparing your sandwiches. I dig their mission! Especially the part where it says, "Run fast to help everyone and give generously to others." That should be our life mission in general! Love the nice Texas touch there with the God Bless Texas sign, the pale blue hydrangeas, and the coffee marquee sign. This place feels like a cozy country home that you just want to stay in for hours. And don't get me started on their housemade bread! And butter! The Vanilla Honey Butter served on a warm toast (ask for Bread of the Day!) was just divine! That, served with a cup of locally roasted coffee or craft tea? Hmm...I know where I'd be going for my Fall/Winter-warm-beverage-fix this year! If you're craving for something more filling than breads and muffins, they have a great variety of sandwiches and salads. My favorites was the Grown Up Grilled Cheese! I had it with some sparking clementine soda, and topped it off with their delicious Cashew Crunch Bar! If you plan to visit this place at anytime soon, I suggest you to start at the bread tasting board. Just pick a bread, maybe a little butter, and sample the delicious baked goods! You won't be disappointed! Their mission about helping people is not just for the sign they hang on their walls. GH Southlake actually saves their breads for homeless shelters! Now that's a bakery, as it ought to be --> Feeding the hungry and bringing a little happiness to people's hearts with one fluffy, made-from-scratch, quality bread at a time. Have an awesome Labor Day weekend y'all!